Working from home has allowed me the convenience of making fresh lunches every day in my own kitchen. 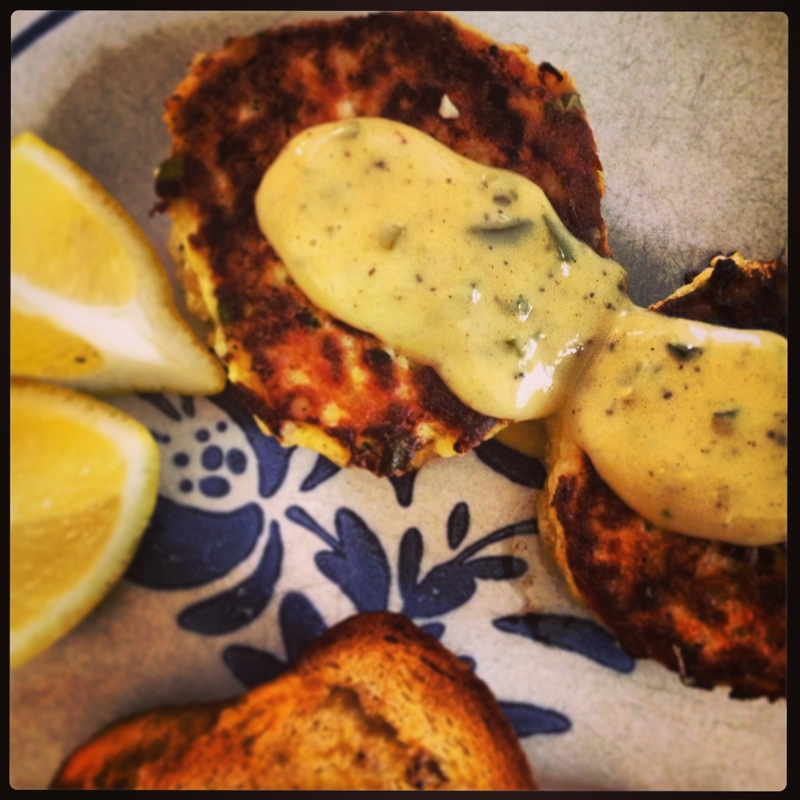 If you read the blog regularly you might know that I love both cooking and eating out. So, while I definitely find excuses to swing by Indochine for fusion tacos after meetings downtown (at least once a week, it’s an addiction — I’m dealing with it), or easily agree to that Friday sushi “business” lunch, most days I am challenging myself to whip something up, at home, that’s somewhat healthy. I’m definitely not gluten-free and personally don’t have any health reasons to be, but for the past week or so have felt compelled to make gluten-free lunches that I still really enjoy. A midday challenge, I guess. Using whatever I have in the house, here are a couple recipe ideas I considered gluten-free successes. 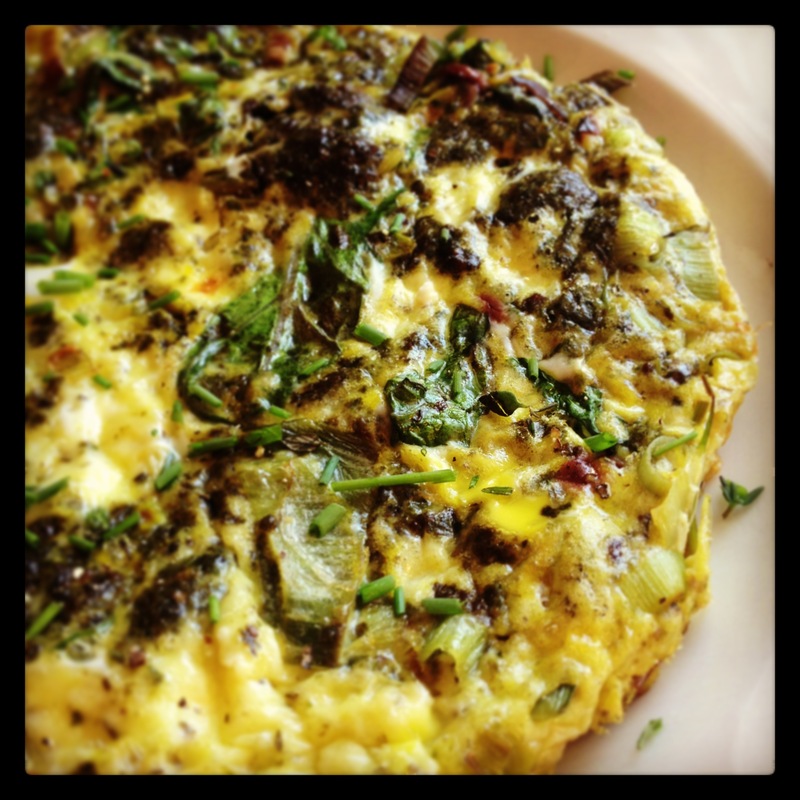 The first is a baby kale, sautéed leek and garlic pesto frittata I coincidentally made on National Kale Day last week. I wasn’t aware of this super important holiday (who makes these up?) but was happy to find out I inadvertently participated, after the fact. We have a perfectly-sized cast iron skillet for making personal size frittatas. This one was sprinkled with chives, and lots of goat cheese after I took the photo. Second, some gluten-free fusion. 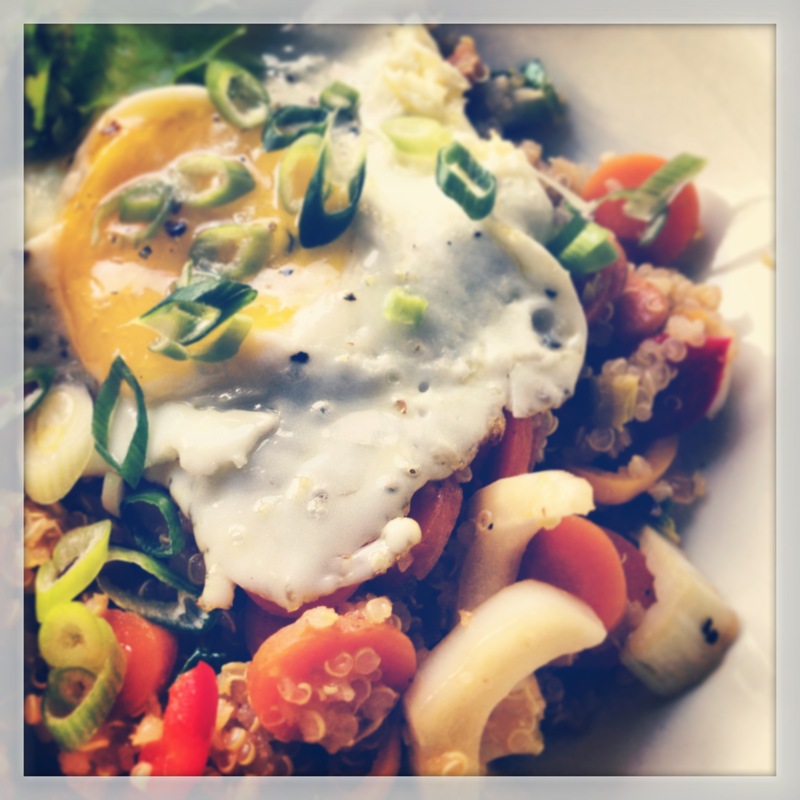 Here we have a spicy quinoa stir-fry. The sauce is made from coconut milk, Sriracha, garlic, ginger and fresh lime juice. I had bok choy in the fridge along with peppers, carrots, corn and green onion. Then, because I felt like it, I put a fried egg on top. The creamy yolk toned down the heat and added some protein. 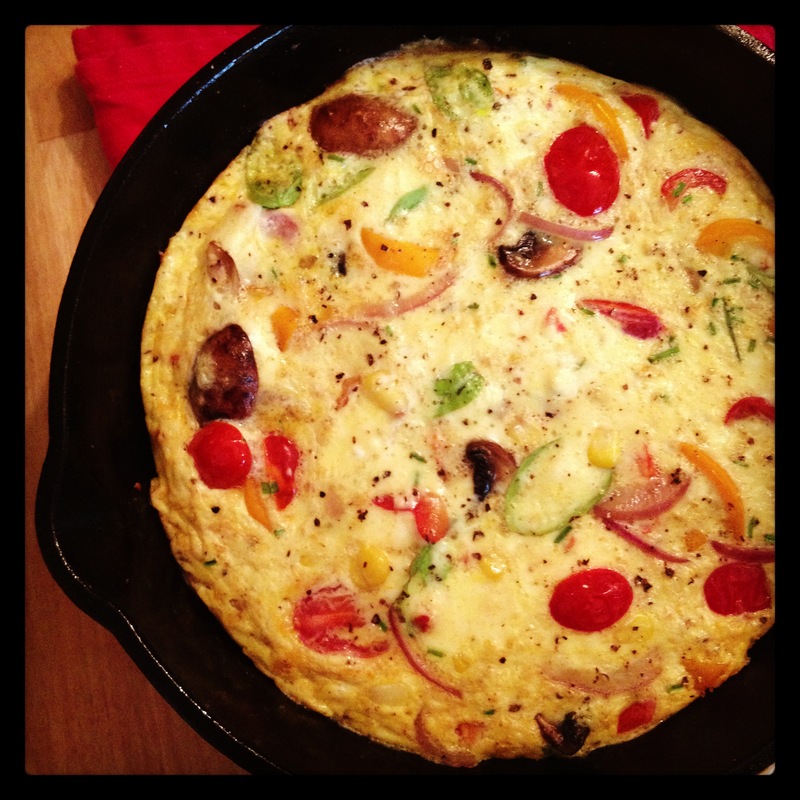 Third is an odds-and-ends frittata. Whatever vegetables you have will work. Throw in some fresh herbs, your favourite cheese, and you’re good to go. I must mention something else I experimented with this week. Putting quinoa in the frittata, with roasted garlic and corn, and also a touch of cornstarch as a binding agent. 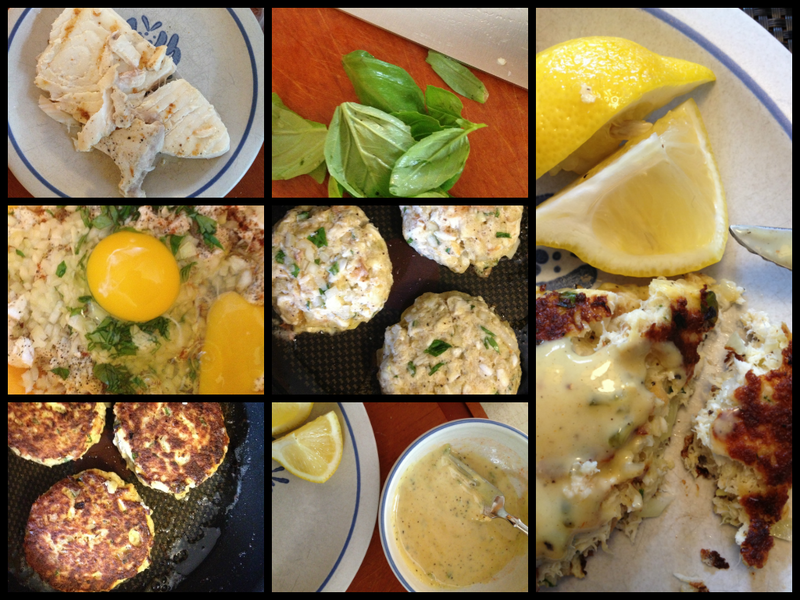 I finished this in the oven on broil; it puffed up and turned into somewhat of a savoury quinoa pancake. I topped it with freshly-made salsa, hot sauce, and some greek yogurt. 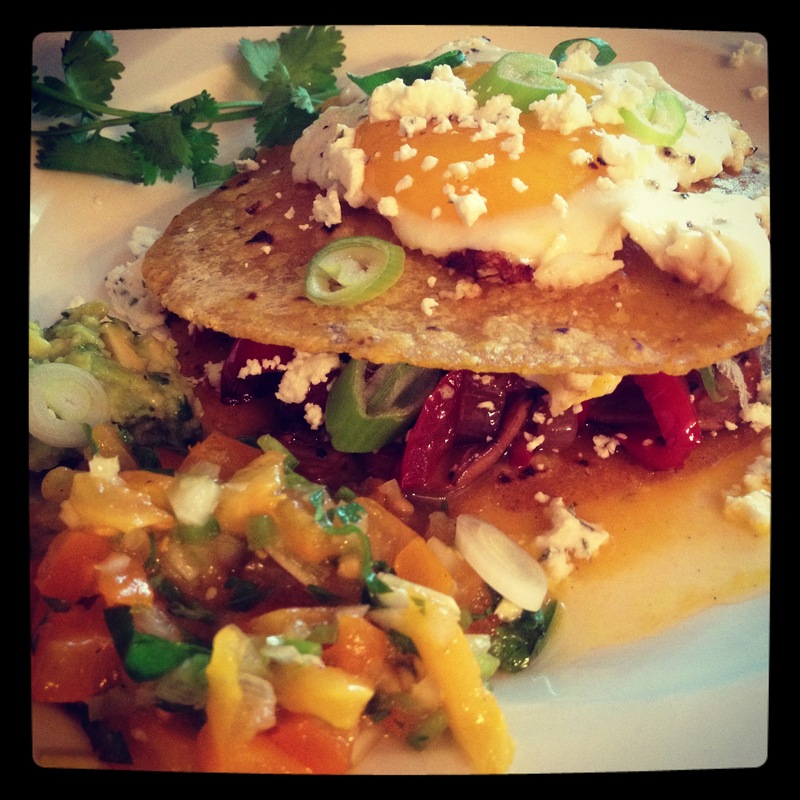 It had a real Mexican feel… I’d make that again. One part of cooking I enjoy is the challenge of taking leftovers and making them new again. Working from home, I have the opportunity to make my own lunch, in my own kitchen, several times a week. That, paired with the fact that we regularly cook dinner together (and it’s usually awesome), means there are often leftovers in the fridge. There’s something inside me that just disagrees with recreating the exact same meal two days in a row. Often I have separate elements of leftovers that I can rework. So, I do this. And I’ve decided to blog about it more. On Friday I decided it was the night for tacos. I made three different fillings: spicy pepper mix with onions, basil-lime sauteed mushrooms, and saucy tomato sausages with roasted garlic. Plus I made a yellow heirloom tomato-jalapeno pico de gallo (with some heat), guacamole, red cabbage slaw, lots of chopped green onion and fresh cilantro. So basically a sweet spread. So good I didn’t even really take photos. I just settled in and ate. On Saturday I was solo and planning to rock my leftovers with a brunch creation. That I did. 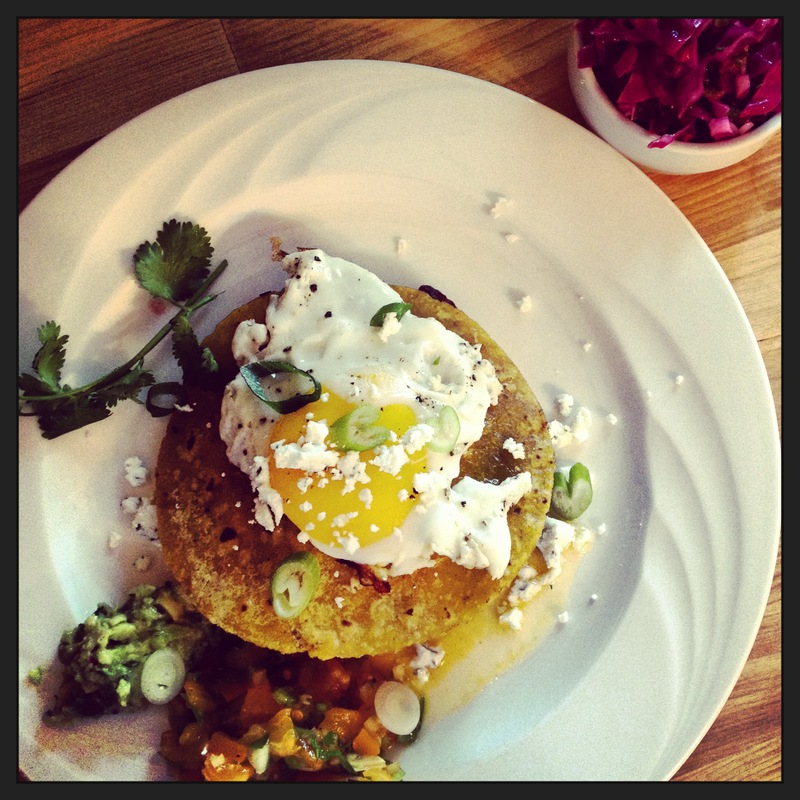 I made a double-layered Mexican brunch tostada of sorts. Okay, so it’s not THAT different from the tacos — but it was very delicious. First layer: masa corn tortilla, spicy pepper and basil-lime mushroom mix, fried egg, crumbled Ran-Cher Acres goat cheese, chopped green onion. Second layer: another tortilla topped with sunny-side up (runny) fried egg, a bit more cheese and green onion, fresh cilantro. Accompaniments: guacamole and pico. 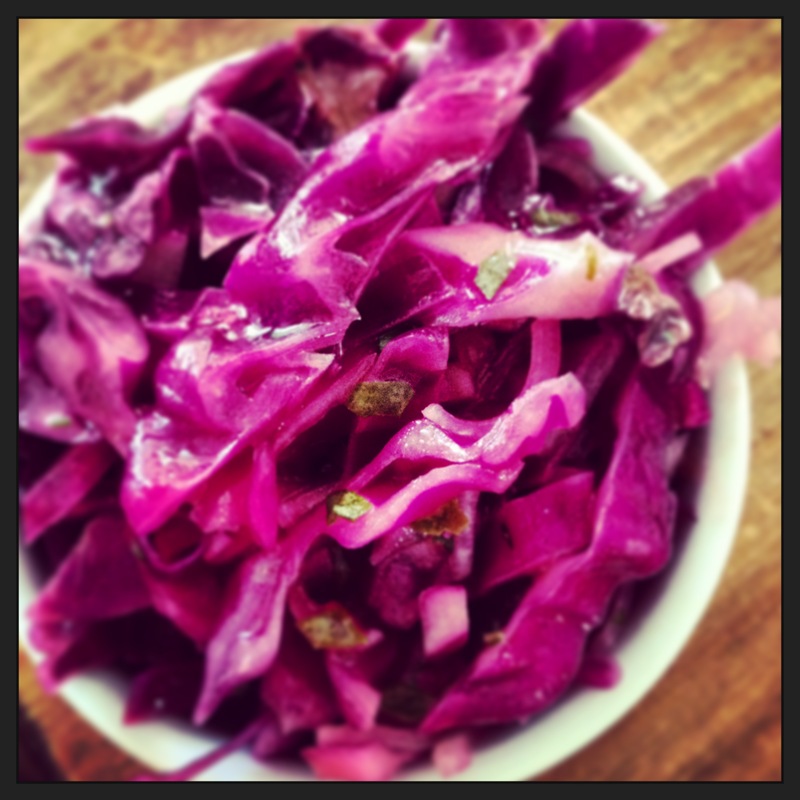 Side dish: red cabbage slaw. A big glass of OJ.